Using the trucker�s hitch and bowline, demonstrate how to secure a kayak to a rack on a vehicle or a trailer, or to a rack on land. Boy Scout Handbook; Fieldbook; Aquatics Supervision; Kayaking BSA; Camping, Canoeing, First Aid, Lifesaving, Rowing, Scuba Diving, Small-Boat Sailing, Swimming, Water Sports, and Whitewater merit badge pamphlets. American Canoe Association. Essentials of Kayak Touring. Menasha Ridge Press, 2005. American Canoe Association, Dillon, Pam, and Jeremy Oyen, eds. Kayaking. Human Kinetics, 2009. Burnham, Bill, and Mary Burnham. Kayaking for Everyone. Globe Pequot Press, 2010. Whiting, Ken. Recreational Kayaking: The Ultimate Guide. The Heliconia Press, 2008. 1. Show that you know first aid for injuries or illnesses that co-occur while kayaking, including hypothermia, heat reactions, dehydration, insect stings, tick bites, and blisters. b. Demonstrate the proper technique for performing CPR using a training device approved by your counselor. include at least one sharp turn. 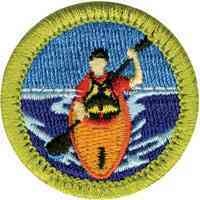  BSA Safety Afloat and tell how it applies to kayaking activities.  Describe various types of kayaks and how they differ in design, materials, and purpose.  Name the parts of the kayak you are using for this exercise.  Demonstrate how to select and properly fit a PFD.  Demonstrate how to choose an appropriately sized kayak paddle and how to position your hands.  With assistance, if needed, ready the capsized craft for use.  Show how to approach a capsized paddler in your kayak and tow him to shore.  While upright in your kayak, right a capsized kayak, empty it of water, and assist the paddler aboard without returning to shore.  Entering and launching a kayak from shore or dock.  Landing or docking and exiting a kayak.  Paddle forward in a reasonably straight line.  Move the kayak sideways to the right and to the left.  Pivot 360 degrees to the right and left.